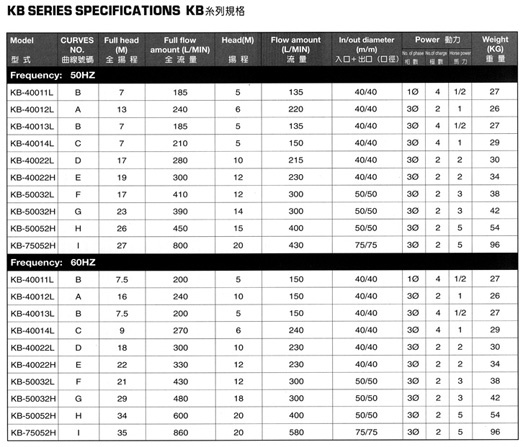 Specially designed cooling for shaft seal. The built-in teflon bellow seal features automatic cooling performance without use of circulated cooking hose. Vacuum self priming design. Extremely powerful self priming force. Built with a choke valve fully prevents liquid back-flow in the pump. Superior corrosion-resistant performance. Material-CFRPP FRPP PVDF (Teflon). If resits strong acid and alkaline. chemical liquid, and pure water. 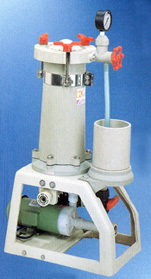 Employs the Japanese imported non-seal pump for leak free performance. with wide area filtering, high efficiency, easy to operat and clean. The filter body is manufactured from PP plastic steel, Choise of PP or acrylic filtering drum. Transparent acrylic resists temperature up to 60 C.
Furnished with 5 feet each inlet and outlet flexible hose and 1 bottom valve. 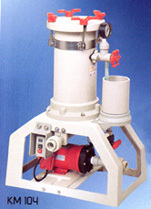 The filter body is manufactured from PP plastic steel. to ensure resistance to high heat and corrosion.